Sten Grendon grew up in the Whiteway Colony near Stroud in Gloucestershire. Partly thinks to the kindness of his teacher, he was spotted by Claude Whatham in 1970 and asked to play young Laurie Lee in the BBC adaptation of ‘Cider with Rosie’, when I was given the part of Eileen Brown. Sten was eight-and-a-half when he found himself in the Lake District playing Roger in Arthur Ransome’s well-loved story, Swallows & Amazons. 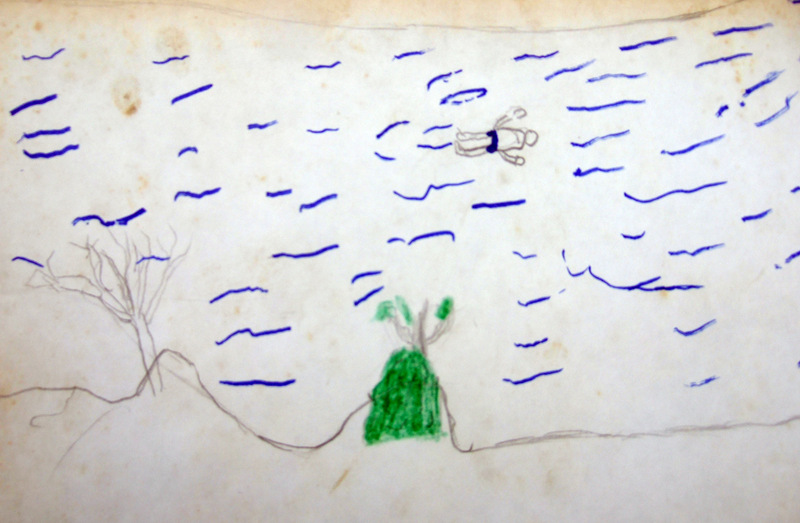 His drawing of learning to swim from Peel Island somehow seems to reflect the weather conditions on Coniston Water rather well. It was raining very hard on Friday. We had our location at Skelwith Fold caravan park. I don’t do lessons with the teacher. I do lessons with Jane. 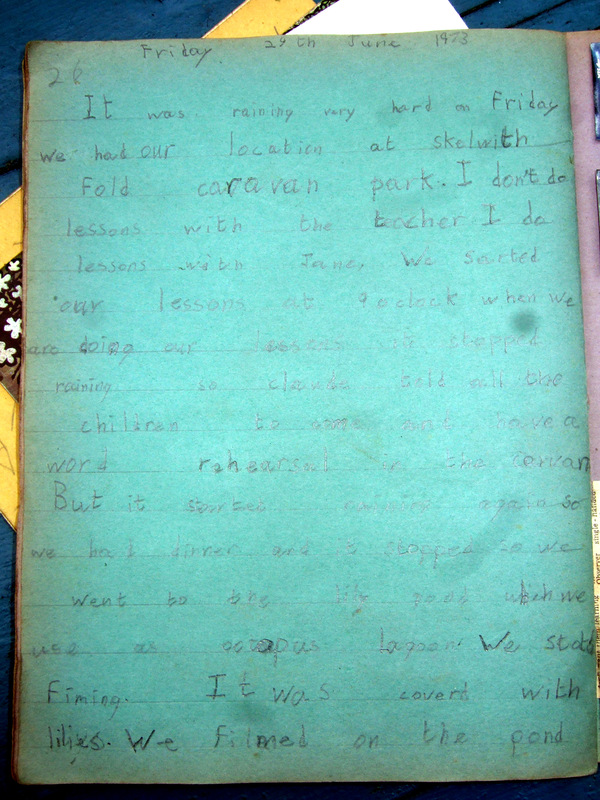 We started our lesson at 9 o’clock when we are doing our lessons it stopped raining so Claude could call the children to come and have a word rehearsal in the caravan. But it started raining again so we had dinner and it stopped so we went to the lily pond which we use as Octopus Lagoon. We started fiming. It was covered with lilies. We filmed on the pond. And that was it. A highly accurate account of the day spent recording the scene when the Swallows go up river to look for the Amazon but find themselves thwarted by waterlilies in Octopus Lagoon. 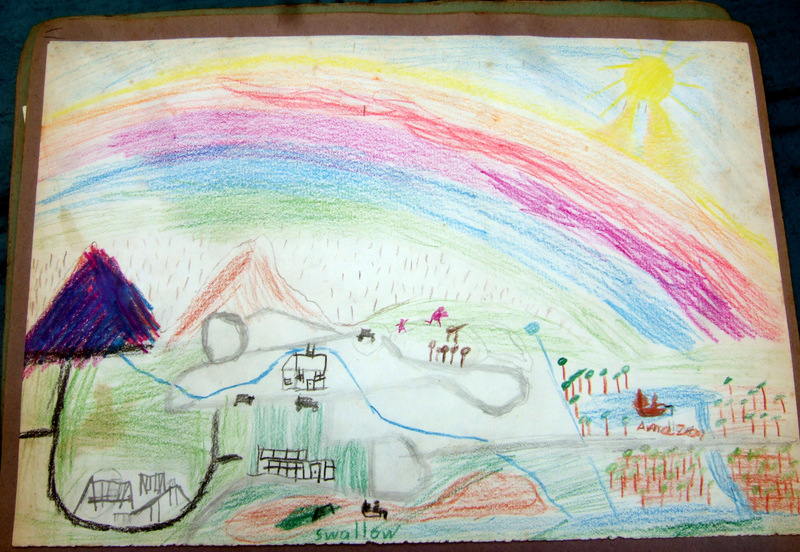 Sten went on to draw a very detailed picture showing what it was like to make a movie in the Lake District, when the weather was so important to our work. Sten still lives in the hills above Stroud in the Cotswolds. After playing Roger in Swallows & Amazons he appeared in a Weetabix commercial for Claude and an industrial film for Rank as a school boy in a story a-kin to the Seven Ages of Man. A countryman by nature, he left acting behind him and literally moved on. After years spent travelling around France, Spain and Morocco, often fruit-picking or working in vineyards, he used his training at Pershore College of Horticulture to work locally as a gardener. Forty years on he still has the same thick dark hair and sudden smile. 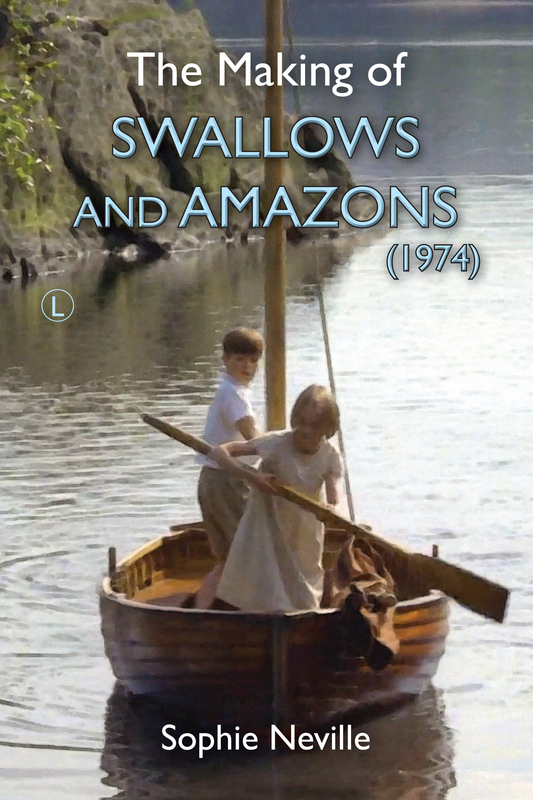 This year, while Swallows & Amazons (1974) was shown on the big screen in London, Cider with Rosie was shown to a local audience at the Whiteway Village Hall – double helpings of nostalgia for those who were able to re-live their own childhood as well as Laurie Lee’s. Another gem, Sophie! How do you do it?? Ever since the film I’ve longed to know what it was like for the children in it. It has been so good to see Sten again. He has fond memories. I can see from one photo above that he was plagued by midges on Elterwater but he could only remember Claude hanging onto his fishing line pretending to be the shark. Thank you! It is so good to get your comments. They encourage me.